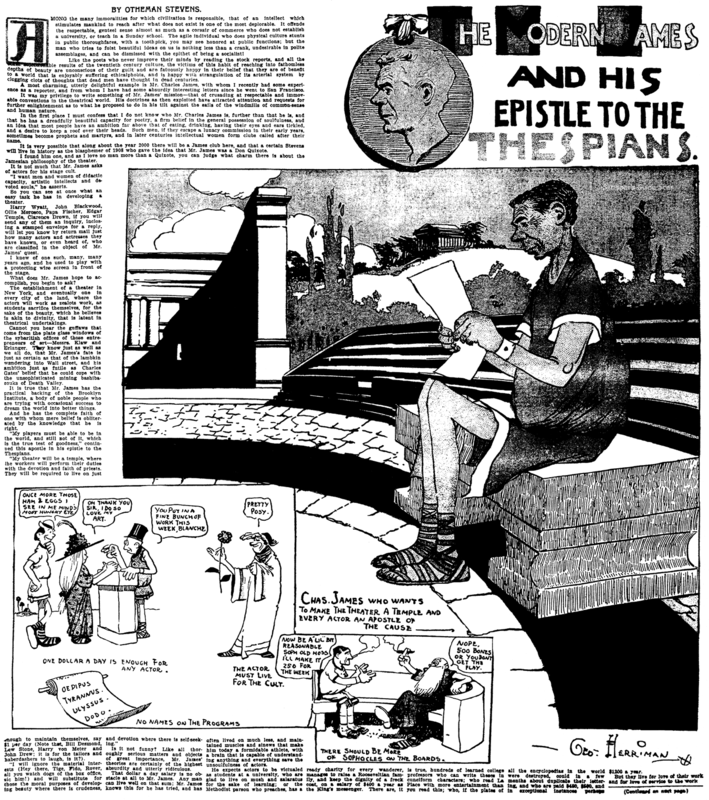 Sunday, May 10 1908 -- It is anyone's guess why the Los Angeles Examiner felt it appropriate to devote an entire color page plus additonal interior page of their Sunday magazine section to a fellow named Charles James. Mr. James, who studied theatre at the Brooklyn Institute of Arts and Sciences, was, in the parlance of the day, a crank. It was his belief, for reasons none too abundantly clear, that actors should subsist on no more than a salary of $1 a day (even in 1908, this was a pretty bare-bones salary). In vague terms, this was supposed to ensure that only those actors who truly were in thrall to the muse of acting would be drawn to the profession. James was on his way to San Francisco to drum up more support for his idea, and hopefully to open a theatre there based on his principles.As far as I know, this never happened. Poor Herriman got tapped to make a rare color appearance in the paper illustrating this odd piece. I'd say he did well under the circumstances.